Fresh off of the approval of the Stage One PUD application by the Zoning Commission on Monday night, the first of two charrette planning sessions was held last night where 33 community members from all over ANC 6D attended to discuss plans for the waterfront park at The Wharf. The proposed park will be located at the southeastern portion of the development, which currently serves as a parking lot for the cruise boats and a traffic circle next to the Harbor Patrol. At 4.2 acres, the park is slightly smaller than the Yards Park in Near SE, which is about 5.5 acres. After taking into account an access road needed for the Harbor Patrol and 26 parking spaces split between servicing the Pier 4 town homes and Harbor Patrol, there will be somewhere between 3-4 acres available for the park. While the waterfront walkway from the park site south to the Titanic Memorial isn't a part of the planned park, the developers want to work with the NPS (who owns the reservation where the memorial is located) to refurbish the promenade in order for it to blend in with all the new development to the north and west. Elinor Bacon from Hoffman-Madison Waterfront convened the meeting at the request of ANC 6D, which stipulated in its approval of the stage one PUD application that the park be built in the first phase of development and a public process was needed to help design the park. Warren Byrd from Nelson Byrd Woltz Landscape Architects and Jeff Lee from Lee and Associates, the two landscape architect firms charged to design the park, were the facilitators. The line of trees bordering the park will be maintained. Several of the tress along the water aren't in great shape though. The group was then split into two in order to gather more input on design of the park. There were some striking similarities between the two groups once reconvened. Both groups thought there should be a large grassy area that's curvilinear in shape with more intimate areas in the periphery. The view from the grassy area should be focused downriver towards the Potomac River. The grade change can be used to create an ampitheather of sorts (similar to the Georgetown Library). A minor water feature like a bubbling brook was asked for as well to create some white noise and allow for getting a little wet on a hot summer day (there will be a major water feature at neighboring M Street Landing). While dogs would be allowed to be in the park, neither group wanted to create a dog park within the park. Creating lighting was desired by both groups to make the park attractive and safe at night. There was a split among the groups whether to have a playground in the park, but child-friendly elements were desired in the park. 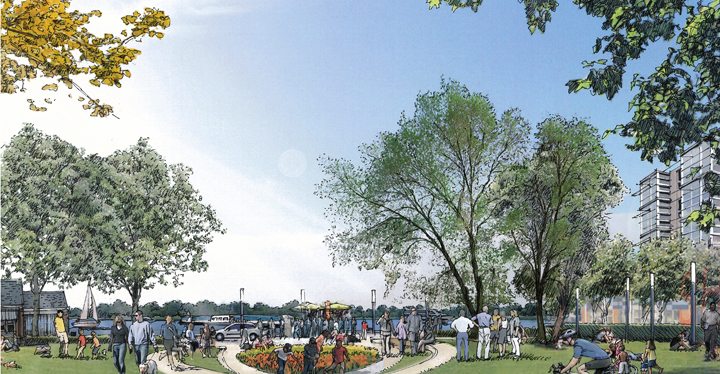 Hoffman-Madison Waterfront will build the park and once complete, will transfer ownership to the District. However, the developers will be responsible for maintaining the park. They will either form an association from within the Wharf development to maintain the public spaces, or they may form a larger BID with other landowners in the area. Another charrette will be held in early October where the landscape architects will share some concepts for the park based on the input from last night's charrette and will seek more input. What elements would you like to see in the waterfront park, so I can bring these ideas to the next charrette? SWill -- One thing that is often overlooked in design plans is continuous no-stair access. Stairs are often used as interesting architectural elements, but to the detriment of bikers, parents with strollers, and people with disabilities. Low-grade, no-step paths should connect the major walkways that bisect the park or run along its periphery. Steps can be included for tiers within the park or to access "optional" areas within the park. However, a person should not have to go by a single step to cross the park in a direct line, or to connect it to the non-park elements around it (i.e., Harbour Square sidewalk or the wide path behind the Titanic Memorial). Also, this might be later in the plan, but advocate for permeable surfaces -- including paths. There are now surfaces that appear paved over, but are permeable for stormwater management. The benefits are huge: helps plant growth around the park by absorbing more rainwater, prevents ponding after larger storms in low-lying areas, eases the burden on stormwater systems (including cutting down on the smell after storms), improves ice/snowcover management in winter letting melted snow trickle through. There is virtually no downside. PostIt: I forgot to mention in the post that the designers of the park will be mindful of accessibility issues with regard to park users who are disabled. Also, since The Wharf development is seeking LEED certification, design elements, such as rain gardens and permeable surfaces will be incorporated.